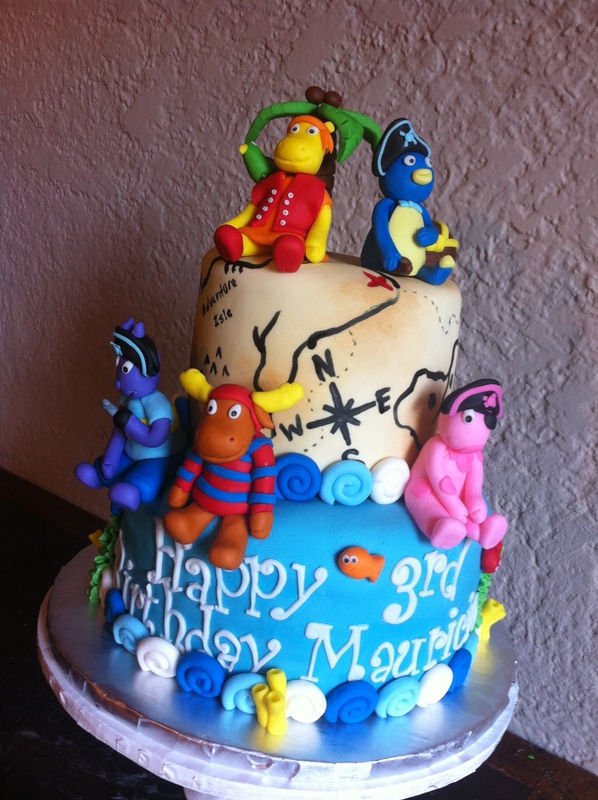 Backyardigans Birthday Cake – Arrrrrghhh! Even though the Backyardigans are 8 years old their popularity has not waned thanks to exclusive episodes being released on DVDs. In fact, the last DVD that was released on March 8, 2011 was titled “We Arrrr Pirates!”. Thanks to this latest DVD I received an order based on this theme. The mother contacted me about creating a Backyardigans birthday cake for her son’s 3rd birthday that was 3 weeks away (always happy when a customer orders a cake early so I can fit them in my busy schedule ). She had sent me several pictures of Backyardigans cakes she had found online but when she also saw my pirate cake she wanted to incorperate the map layer onto the cake too. So I said, “No problem, I can do that”. I based the characters off the latest episode with their peg legs, eye patches, treasure chest, and hook to complete the look. I ended up spending about 3 hours sculpting the details of all 5 of the characters. How do you think it turned out? Backyardigans birthday cake with scultped figures of Pablo, Tyrone, Tasha, Austin, & Uniqua. Cake includes a ocean based bottom layer, pirate map themed layer, tpped with a palm tree.